MLB season is right around the corner, and I couldn't be more excited. And that has more to do with the systems involved in MLB more than anything. Sure, it's great from a DFS standpoint, but it's even better from the analytics perspective. You aren't trying to project how many minutes a Pitcher is going to get in a rotation. You aren't hoping that the games stay close, so you can get all the possible times at bat for the Hitters. It's a very pure kind of game, and the appreciation is in its simplicity rather than the chaos. That last sentence is actually kind of a funny thing to say about MLB because it is such an event-oriented sport. Home runs and stolen bases are some of the most impactful instances in all of the sports, and they are a chaotic measure in a game that is mostly just throwing a ball back and forth. The excitement that both bring to the game are paramount to its success over the years, and we as spectators are always hungry for more chaos in this game of pitch and catch. 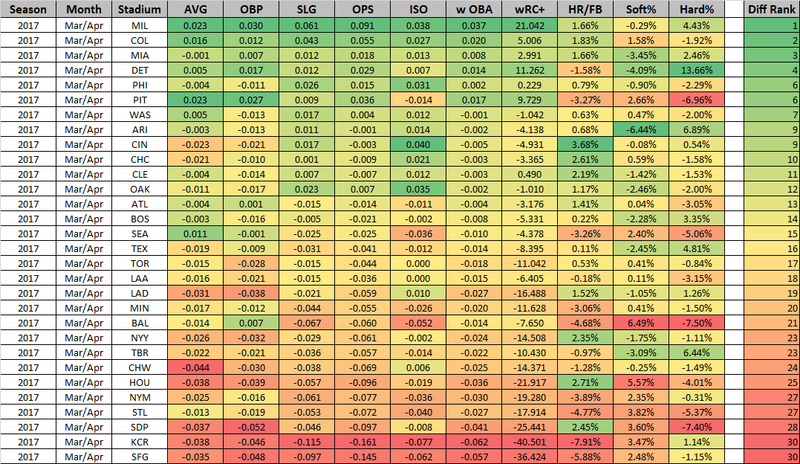 But back to projections, and how much more static they are in MLB! There is a wealth of data out there that can tell you just about anything you want to know about interactions in a baseball game, from batting averages to batted ball statistics to how far a ball is flying off the bat on average for any given player. Indeed, the most difficult part of MLB and projecting forward is knowing what statistics matter and avoiding those that are (popular) noise. It's easy to be able to look at a data sheet and find the best hitters or the best pitchers, but being able to place those in a correct context and take advantage of the data in a pure form with just enough specificity is what separates the good from the great. In honor of Opening Day being just weeks away, let's take a look at some items in the context of how they will affect things right off the bat (pun intended). I'm going to be looking into hitting data in the early months and finding the places under the least influence of early season weather, the Humidor in Arizona, and some bullpen changes that will change the way that we look at stacking opportunities. Throughout the year we are going to talk about park factors a lot in the DFS industry. We are going to talk about how they affect HR rates, how nasty the weather can (and will) get in certain parks, and how much of an advantage hitters have in a certain environment. Coors in Colorado is the first known example of this where the altitude causes the ball to act drastically different than every other park in the league. But these park factors aren't consistent across the entire year, and early-season weather patterns can lead to some parks being a nightmare for hitters. We can see that March/April baseball has by far the worst hitting performance out of any month in the year. This is intuitive considering that the colder the weather, the harder it is for the ball to cut through the air, thus the less distance it will travel. The data shows that to be true with depressed marks in basically every hitting category available. Something else to note, however, is that the strikeout rate does not spike with these hitting woes, and the walk rate was actually second best for all the months, so just because hitting suffers it does not necessarily mean that pitchers are thriving in this time span. So we know that March/April are the worst months for hitters, and that making contact with the ball is less meaningful than other months. But are there parks in the league that feel those effects less than others? Full Disclosure: MIL data is slightly skewed thanks to the Braves going Super Saiyan in their series, and adjusting them to even a 20% jump from average turns MIL into about the eighth best park (Still a positive place to attack, but not top overall). What can we take away from this? COL is going to be a top hitter's park any time of the year, so long as the game is not postponed. TBR (Tampa Bay) is generally assumed to be a place to attack in early season games because it is a dome and safe from weather, but the data shows that it is slightly below average. The most important thing for me when diving into this data is that we don't just want to target parks that are in a dome or that give hitters an easier HR ball. We can see that parks like SDP (San Diego) and HOU have above average HR rates but are bottom 5 in the league in compared averages in almost every other statistical category. What this data suggests is that we should focus on balls in play, not balls over the fence. When we go back and look at the overall averages for the league, March/April has the lowest BABIP, AVG, OBP and OPS numbers, and so focusing on parks that enhance a hitter's ability to get on base should be the most beneficial process. With that being said, parks like DET and PIT both get a bad reputation from the DFS community considering their size and lack of home runs, but both offer a huge outfield and plenty of balls in play, and the data shows n early season baseball that is one of the largest advantages we can find across the league. We can use this knowledge to differentiate ourselves from the pack and get some contrarian builds with sneaky upside in perceived pitcher's parks. Everyone knows about the Humidor. It's the biggest topic of discussion over this offseason and is going to change everything about how we attack Diamondbacks home games. When the Humidor was implemented at Coors field, we saw the home run rate drop by 22% and the batting average drop 7%. The Coors field Humidor was adjusting humidity in the baseballs stored by about 13% (from 37% humidity to 50%) while the Chase field Humidor is going to almost triple that adjustment (from 13% to 50%), so the drop in home runs could (should) be massive, turning Arizona into a borderline pitcher's park. There has been a lot of research done on this topic but all of it points to a consensus thought: We are going to want to avoid hitters like the plague, and pitchers will be seriously undervalued until the numbers catch up. Especially because we know that the DFS algorithms at the major sites price players according to (among other factors) historical data. I would guess that pitchers will be grossly underpriced to start the season until a manual bump pushes guys like Zack Greinke and Robbie Ray up to where they should be. The Rockies: With the addition of Wade Davis from the Cubs, Brian Shaw from the Indians, and retaining Jake McGee, the Rockies have one of the best bullpens in the league. Those three alone combine for over 3 WAR, and should point to a new strategy for the Rockies pitching staff as a whole. Considering their lack of a true ace and the depth of their pitching staff, I would expect the pitchers to have shorter outings and the bullpen usage to go way up. We saw this a bit last year when the Rockies had a SP getting beat up early, and I would think it becomes the norm as many teams in the league have already alluded to this kind of pitching usage in the offseason. I would be very reluctant to stack against the Rockies, especially away from Coors. The Angels: The Angels entirely overhauled themselves this offseason and are a legit contender after adding great offensive pieces and stud arms to bolster their bullpen. Additions of Pat Neshek, Anthony Swarzak, and Brandon Morrow make this bullpen a force to be reckoned with. Very similar to the Rockies, the Angels have question marks in the rotation with Parker Bridwell and J.C. Ramirez, and we don't know about the health of a couple of others, but they should feel more than comfortable running short outings from the rotational guys and bringing in their relievers to finish off games. The Angels had a decent bullpen before but now have a Top 5 unit in the league. Stacks beware. That's going to do it for my early season breakdown of parks and bullpens, I hope you learned some things and are just as excited for the MLB season to begin as I am! You can find me on Twitter at Paydirt DFS, Thanks for reading!